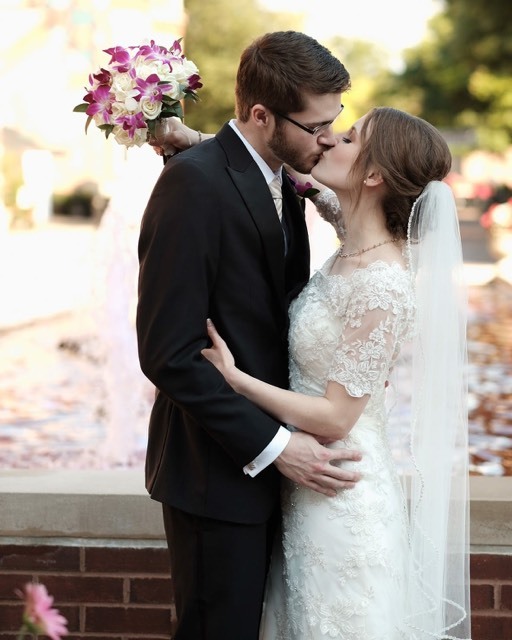 When Christopher emailed me photos of his wife’s bouquet, I knew I was up for a challenge. The colors and variety of flower were stunningly beautiful, but also unique. There were peachy roses, a bit of ivory Hydrangea, pink/purple Waxflower, Veronica, tropical grass and greenery, a teal accent flower and the elusive Leucodendron. 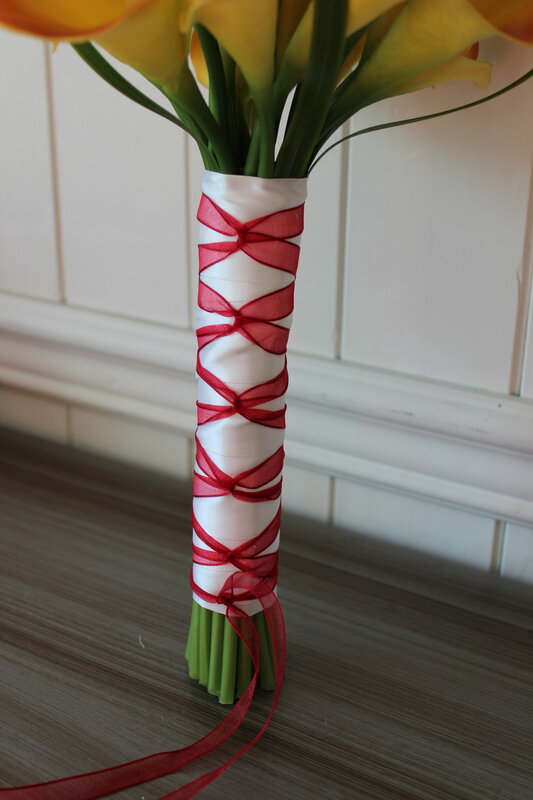 I knew there were going to be a couple of items that were going to be tricky to find for this silk bridal bouquet recreation, and in the end a substitution would need to be made. 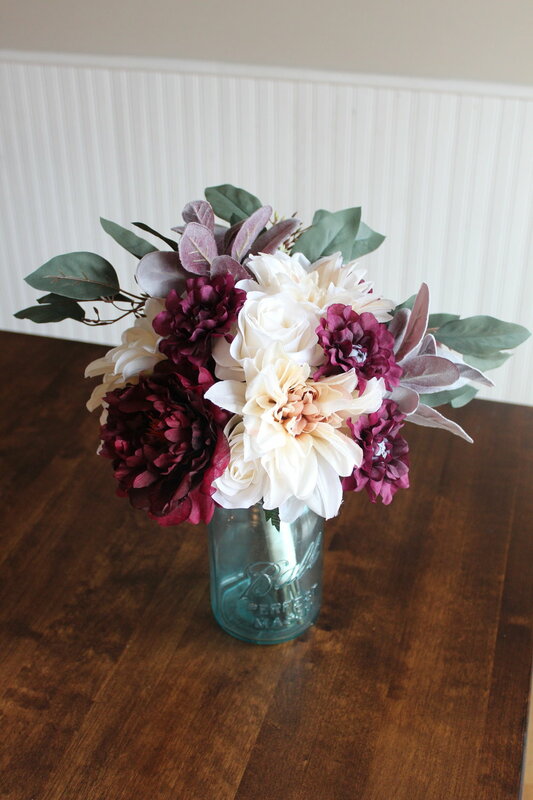 But take a look at the end result of this awesome bouquet recreation! This bouquet was both a unique shape and composition and one that challenged me in some new and exciting ways! I couldn’t find the right shape of rose bud, so I found a peony bud that made the perfect stand in. Then, that Leucodendron stared me down in all it’s burgundy glory. I couldn’t find one that was the right size or color, so I put on my crafty thinking cap and came up with a plan. To get it just right, I had to piece together several of the same type of flower and dye it to the right shade to get just the right look. Sometimes it takes some extra creativity, but it’s always worth it in the end! This stunner made it’s way to a military base in Japan for a sweet anniversary gift! If you are looking for just the right anniversary gift, a bridal bouquet recreation in silk flowers is absolutely the right choice! And if you’re worried about a unique design or flower getting in the way, fear not! Contact me today for more information! Emily’s bridal bouquet was beautiful, interesting and so romantic! 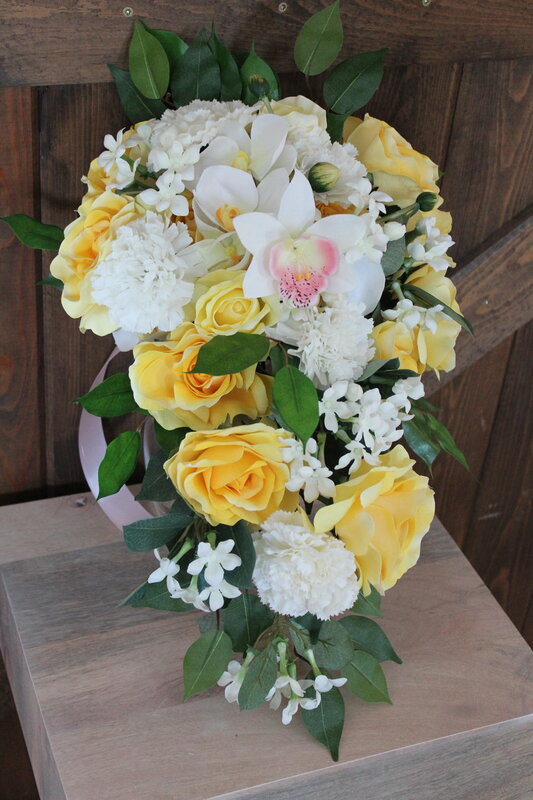 Roses, Orchids, Freesia, Mums and Ruscus made this elegant bouquet so soft looking and very, well, bridal! 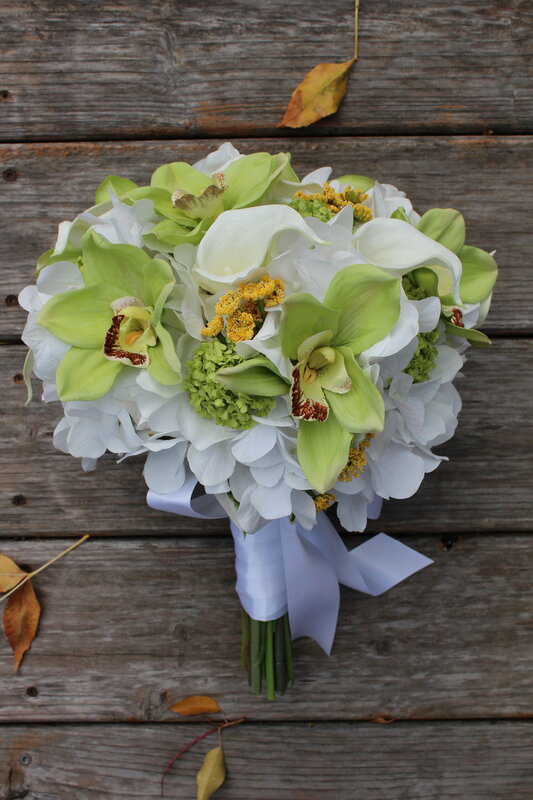 Take a look at this amazing bouquet! Thank you so much Erin! I absolutely love my bouquet and I’m so glad I was able to find you and your services! 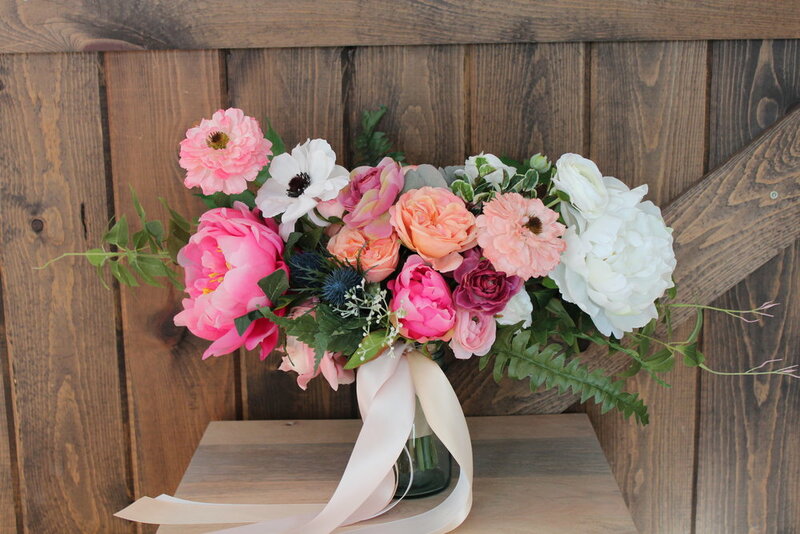 Here’s the original gorgeous bouquet, captured beautifully by: Wright Photographs. 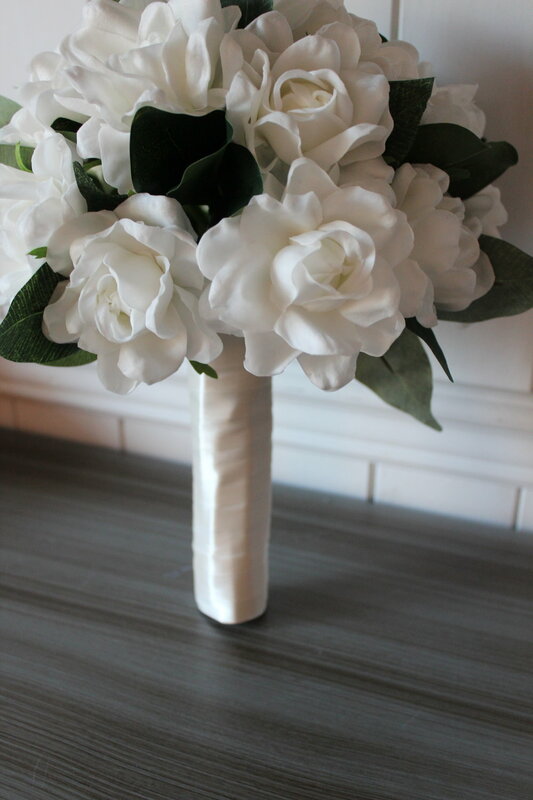 If you’re curious about having your bridal bouquet recreated in silk flowers, contact me today for a free quote! Unless you are the bride ordering your custom bridal bouquet recreation in silk flowers, some of the details may escape you. And that’s ok! There’s a couple of options if you can’t quite remember what color the ribbon was or the exact type of every little flower. 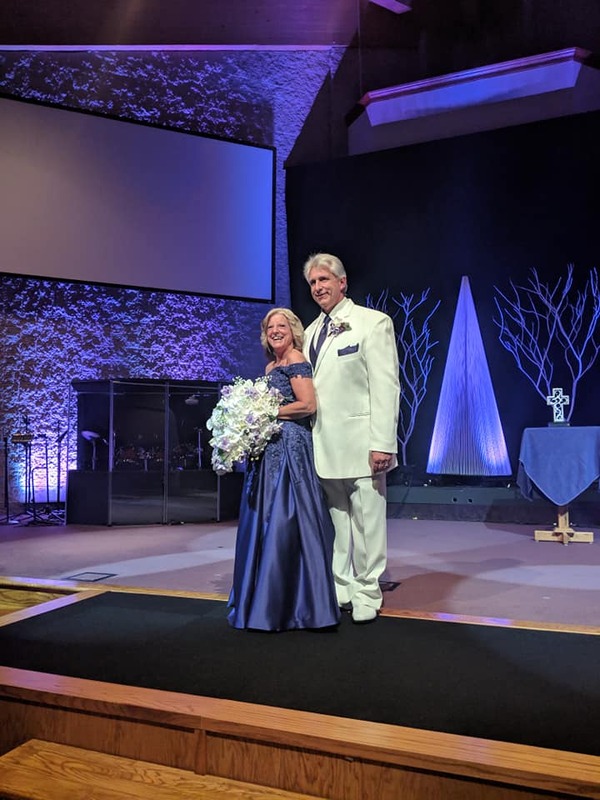 In MacKenzie’s case, his mother actually built his bride’s bouquet, so he was able to pass along my questions and find out those details that would make a difference. Don’t have your mom to ask? Contact the original florist, search your emails for an invoice, or ask a bridesmaid who might be able to recall those details you are seeking out. Lilies, roses and baby’s breath. Simple, beautiful, elegant! It was so helpful to get MacKenzie’s feedback on what was in the bouquet. 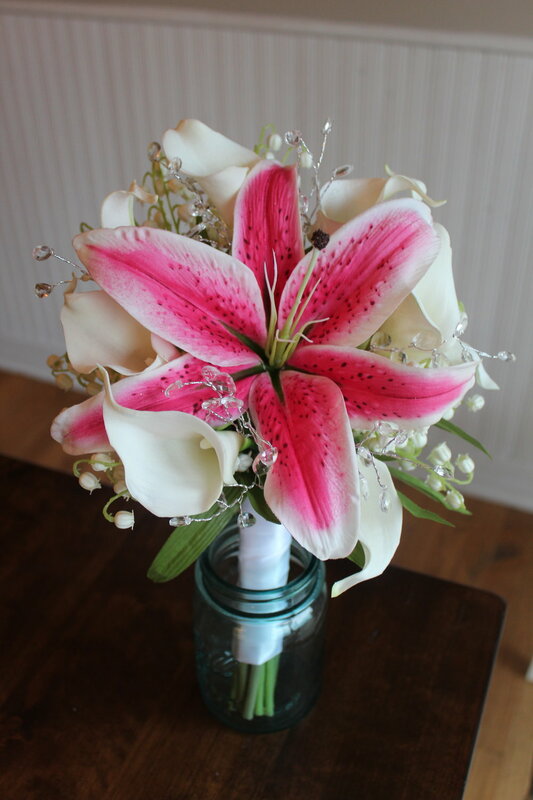 For instance, from this photo, I couldn’t tell there was a small stargazer lily at the back of the bouquet. 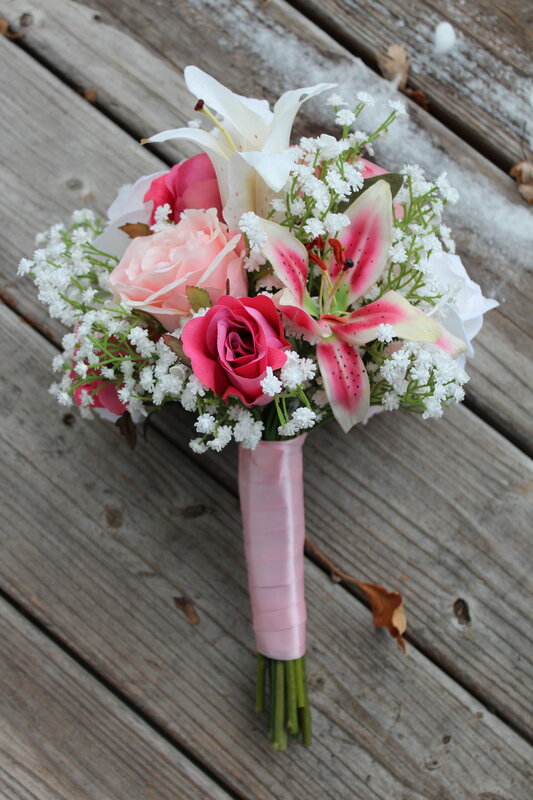 MacKenzie was able to give me a run down of all that was in the bouquet as well as the fact that the ribbon was a light pink, not coral as it appeared in his photos. Whether you know every single element of the bouquet or just have a vague idea, contact me for a quote on what it would take to get it recreated in silk flowers. We’ll be able to capture the feeling and overall look of that special bouquet with a little teamwork! 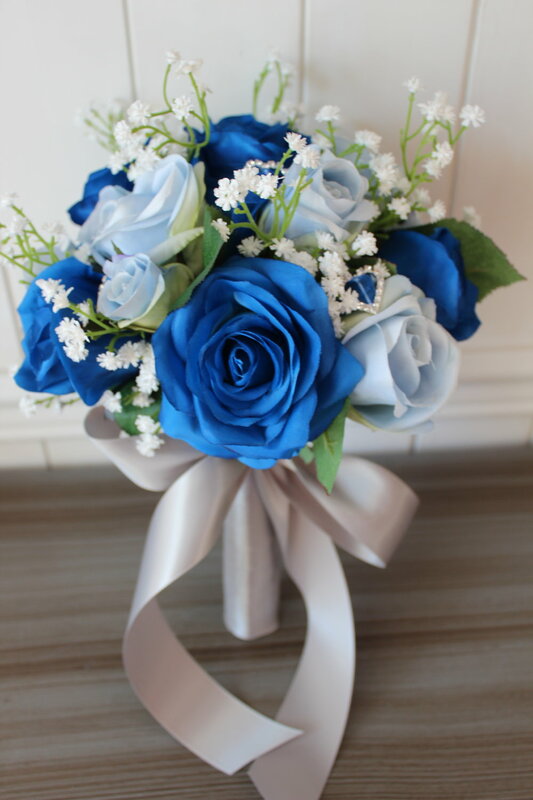 I’m not gonna lie, blue is a hard color to include in silk wedding flowers. Not many flowers show up in nature in a royal blue color, but that didn’t stop me from coming up with a design for April when she emailed me this fall. She sent me a swatch of the color her bridesmaids would be wearing, some inspiration pictures of bouquets she liked and we came up with a plan. 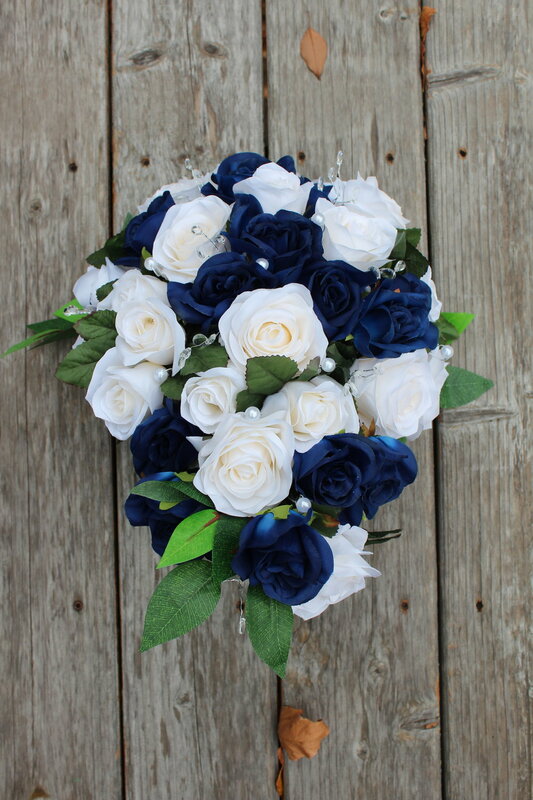 I found some beautiful blue roses to match her swatch along with some light blue roses and touches of white for in the bouquets. Take a look! 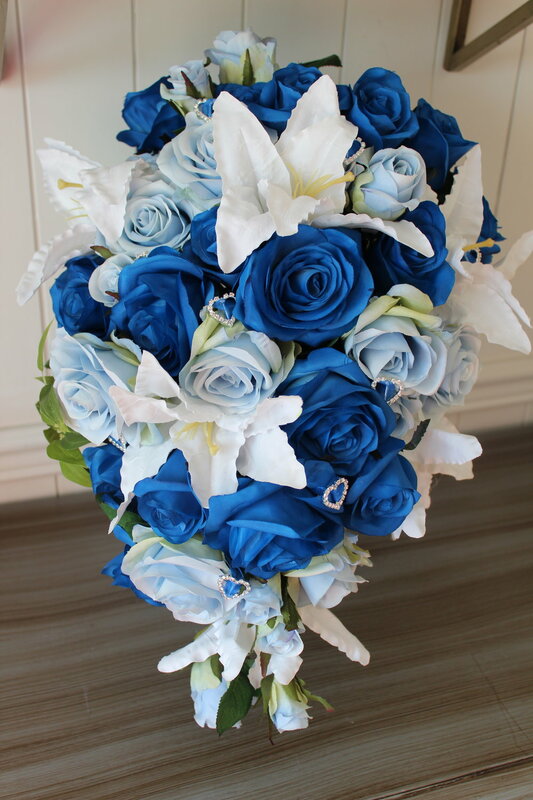 The bridal bouquet included the royal blue and light blue roses along with some white lilies. 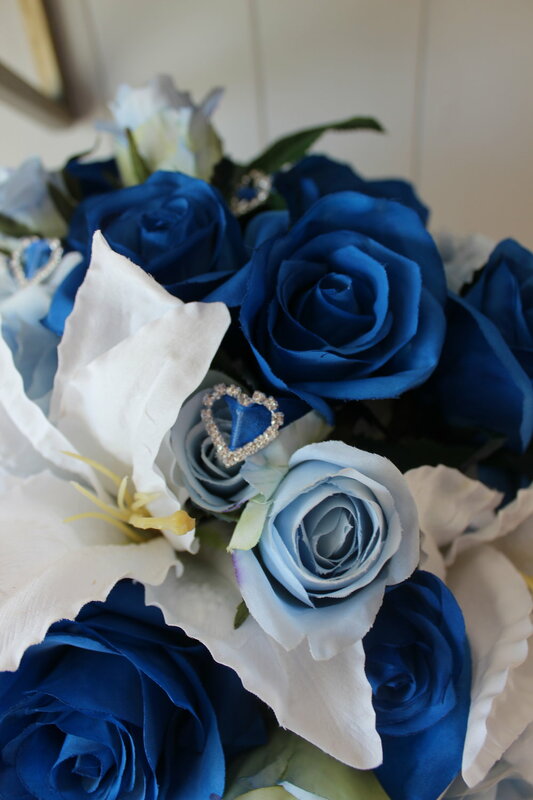 Here are some photos of the details that really added some nice touches to her bouquet. One of the accents April wanted to include were some silver hearts, an element she was incorporating into her overall theme and decor. 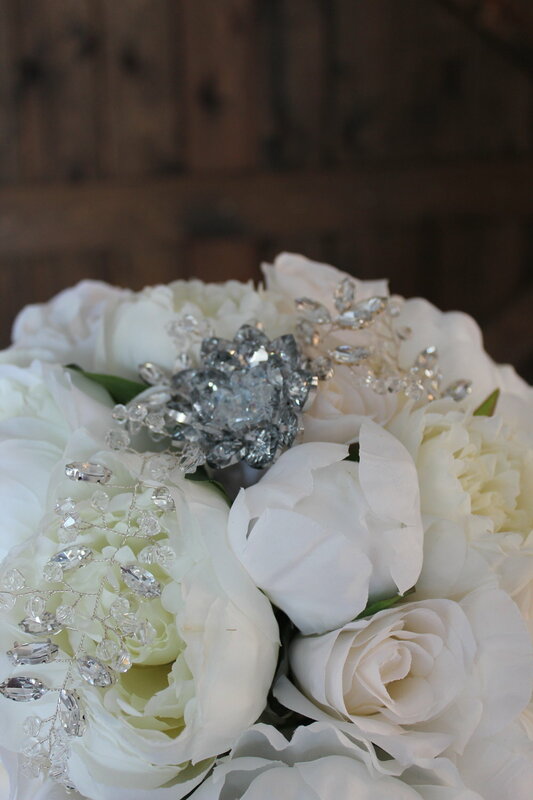 I found some lovely little silver and rhinestone hearts and added them throughout her bouquet. April decided on matching royal blue ribbon with a bow to finish it off and it looks amazing! 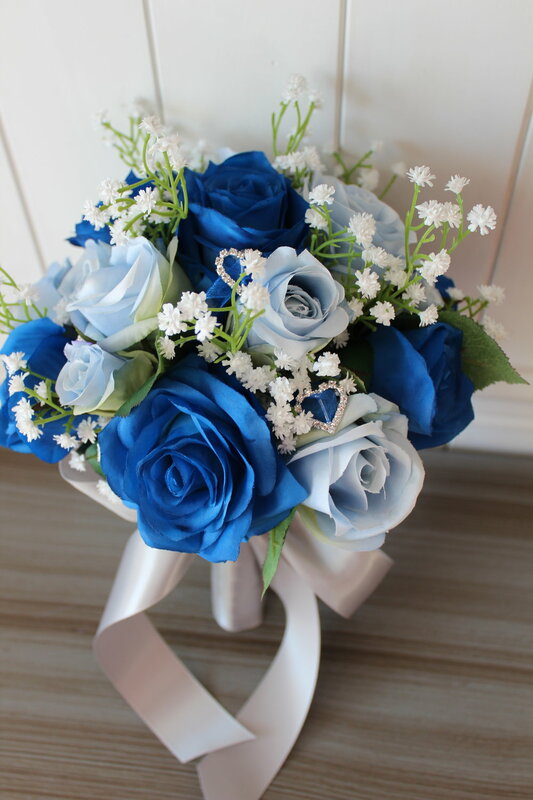 The bridesmaid bouquets included the same royal blue and light blue roses, but we added in some baby’s breath for a little contrast and texture. April wanted their bouquets to be a little different, so we decided on silver ribbon to tie them off. Another look at the details of the bridesmaid bouquets—silver rhinestone hearts and ribbon bow to match the bridal bouquet. Is this your color scheme and you’re struggling to find flowers to match? Contact me today to talk about options! 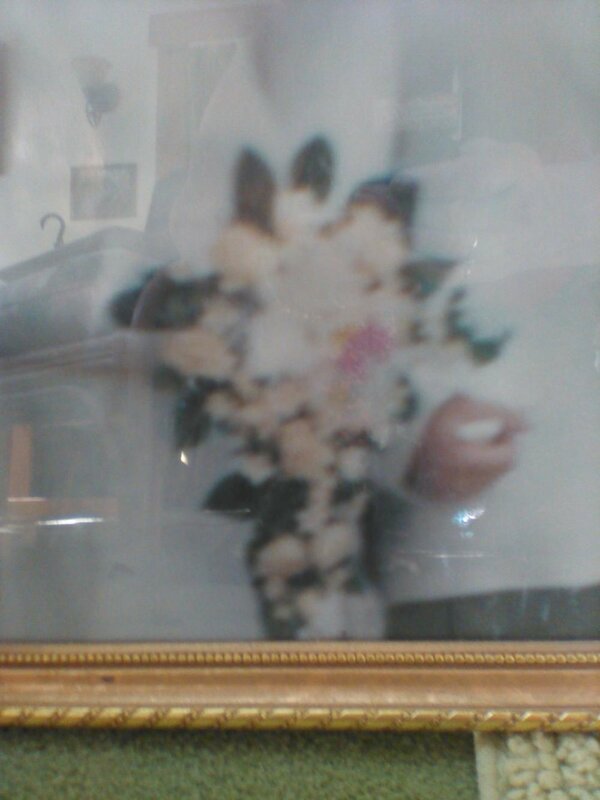 Ryan contacted me hoping to have his wife’s bouquet recreated for their early October anniversary. They were married in Scotland and the venue had used its own garden to create her beautiful bridal bouquet. She was unable to bring it back to the states with her because of those pesky air travel regulations and was understandably disappointed. So Ryan set out to surprise her with a silk recreation. 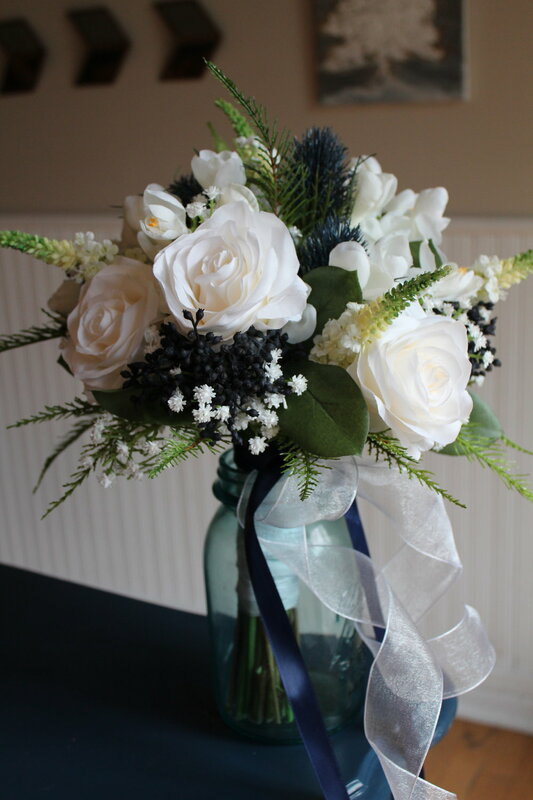 Her original bouquet included ivory Roses, Scottish Thistle, Veronica, Baby’s breath, Freesia, Fern, and some small blue berries. It was a stunner! How romantic is this?! This bouquet was such a beauty and I loved getting to remake a piece of their special day. If your destination wedding meant you had to leave your bouquet behind, contact me today to find out what it would take to have it a silk bridal bouquet recreation made for you or your bride. There are lots of trends that come and go, but there are a few that I think will never be on the way out: wedding dresses and bling being a few of those. 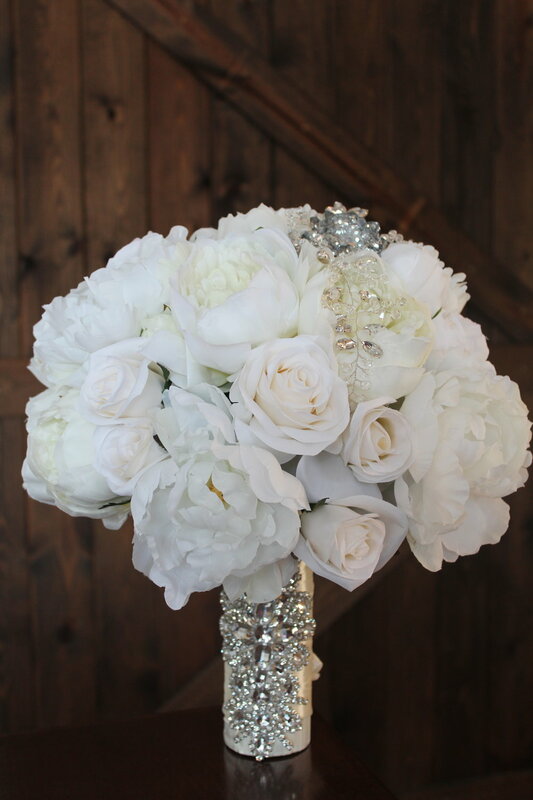 Take a look at this beautiful (and huge) silk bridal bouquet in a classic ivory and white color palette with some lovely bling. -Roses and Peonies in ivory and white. -Rhinestone and beaded leaf piece accenting a central starburst broach. -Special ordered handle wrap with ivory ribbon and hugely awesome rhinestone piece. Have something spectacular in mind for your bridal bouquet? 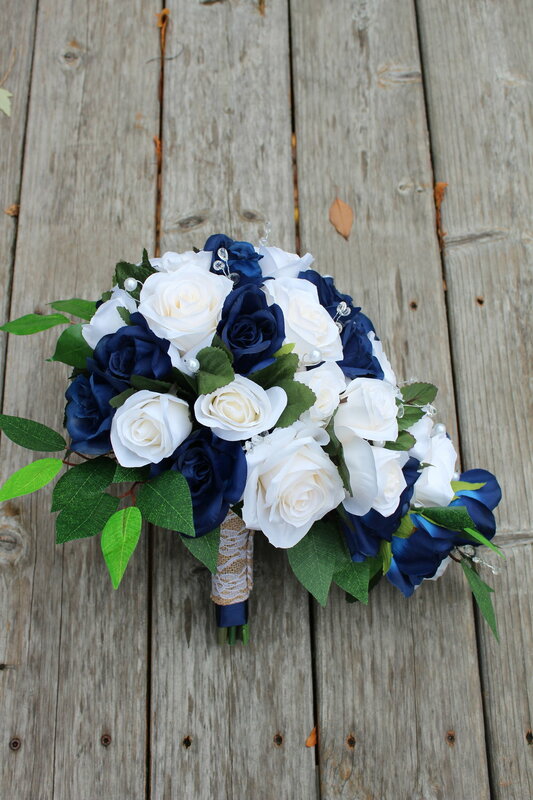 Contact me today to find out how we can design a bridal bouquet in custom silk wedding flowers with uniquely chosen bling pieces to complement your magnificent bouquet. The bouquet recreation process is relatively simple. Take Kate’s story for example: she contacted me on a Tuesday, had a quote by Thursday, placed the order Friday and voila we were in business! 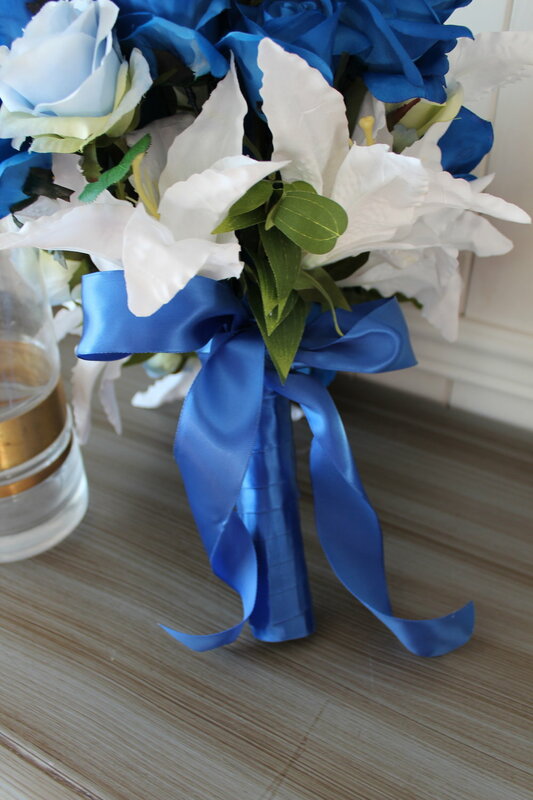 Now she has a beautiful bridal bouquet recreation in silk flowers. Take a look! 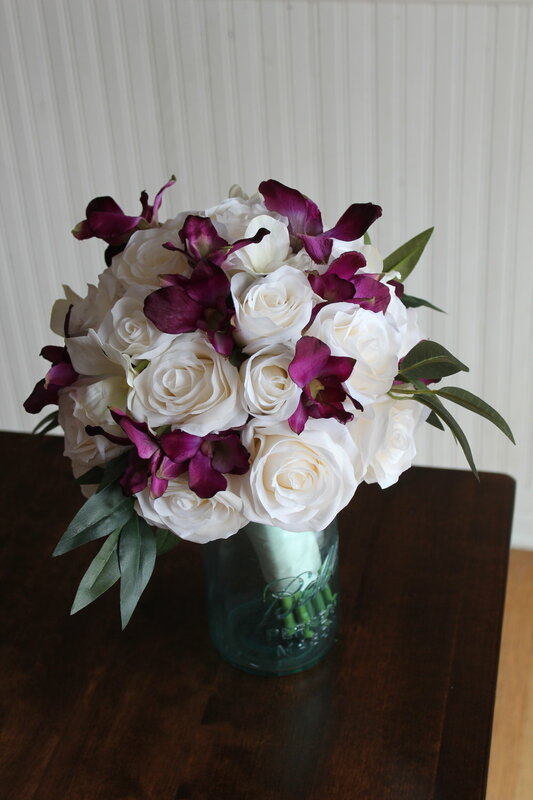 Ivory Roses, Ivory and Purple Dendrobium Orchids, Ruscus. Here’s a side-by-side of Kate’s beautiful bouquet. Photo by: Paul Lender of Left of Center Photography. 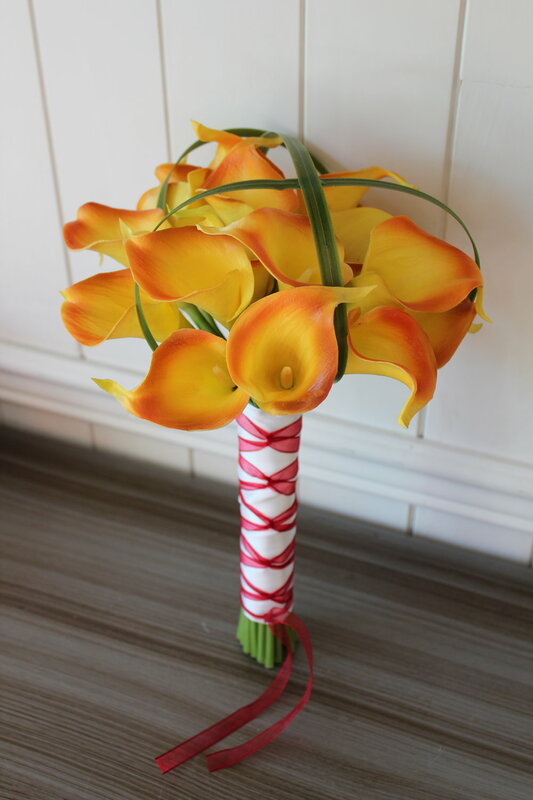 Interested in having your bouquet recreated in silk flowers? Contact me today for a free quote! Pam knew the weather here in Minnesota is not to be trusted, so she had this amazing cape to throw on her shoulders. It looks magical! 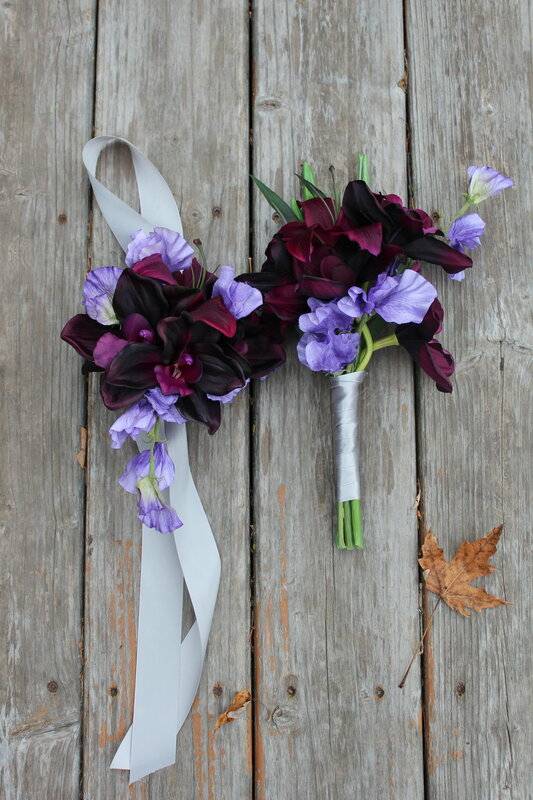 If regency purple is on your radar and you are looking for ways to work it into your flowers, fill out the Free Brides’s Checklist for a quote and let’s get started! Pam called me with some ideas about she wanted for her wedding flowers. Her wedding dress was regency purple and she wanted to accent with that color in her bouquets, but was worried about it not being a close enough match. 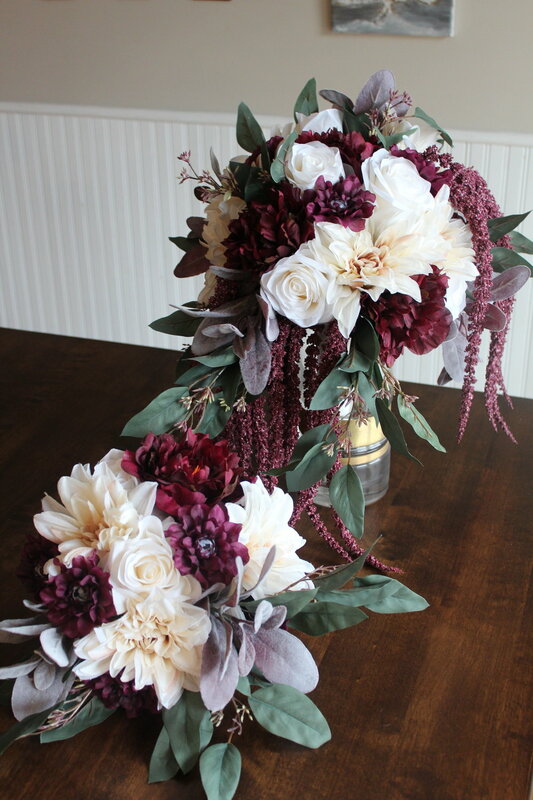 I sent her over to my blog to look at some bouquets I had previously made and she fell in love with this cascading bouquet that actually had a lighter shade of purple. This lighter shade was a great match to what her bridesmaids would be wearing, so I decided to design the bouquets from an “opposites” approach. Basically, the bride is wearing regency purple, but carrying white and lilac while the bridesmaids are wearing lilac and carrying white and darker purple flowers. That way we didn’t have to have exact matches, the purples would stand out against the dresses and both colors would be included. Take a look at what we came up with! 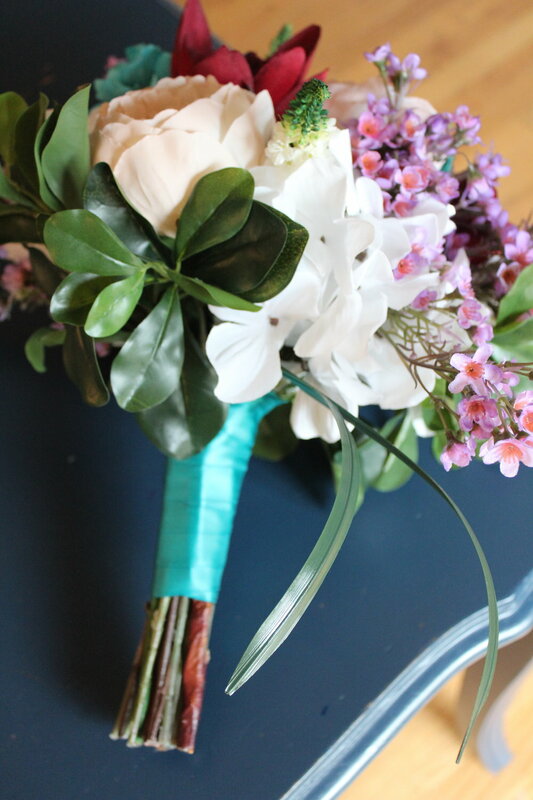 Bridesmaid Bouquet: Hydrangea, Waxflower. Toss Bouquet: Hydrangea, Waxflower, Baby’s Breath. Here’s a look at the bouquets all together to see the contrast between the purples. They look lovely together! Here’s a shot of a couple of their boutonnieres and corsages. She chose to have the regency purple in the groom’s boutonniere and switched it to the baby’s breath for the other boutonnieres. The only corsage was an attendant’s wristlet that featured each of the types of flowers. 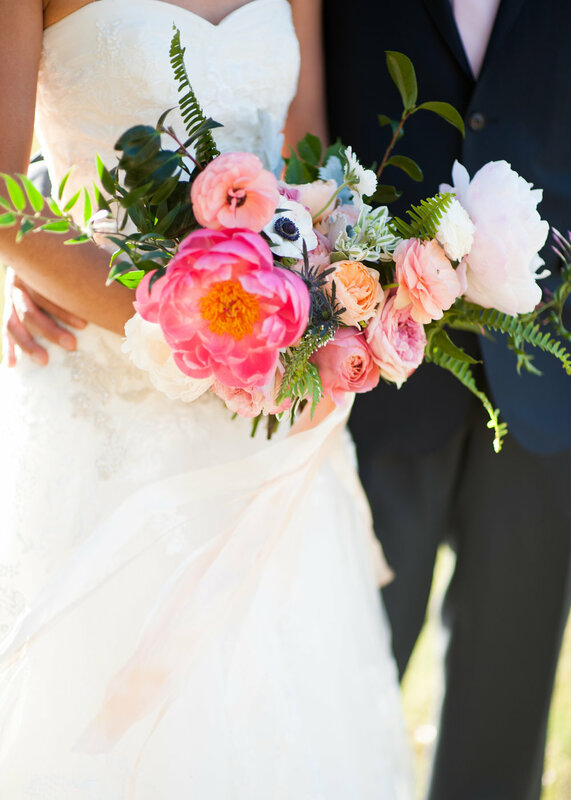 If you are wearing a dress that is a non-traditional color and you want to incorporate that into your bouquets, contact me today to find out how we can work it all in without getting too saturated by it. Check back later this week to see some photos from Pam’s wedding! 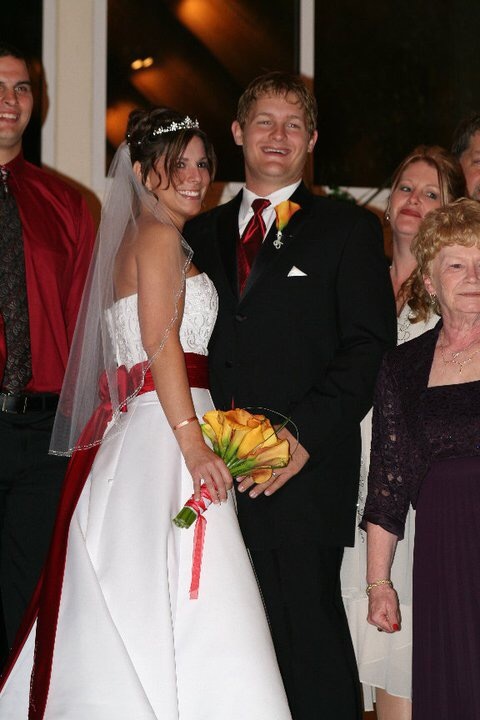 Bill sent me a couple of photos from his wedding….52 1/2 years ago! So the photos Bill sent me weren’t ideal. 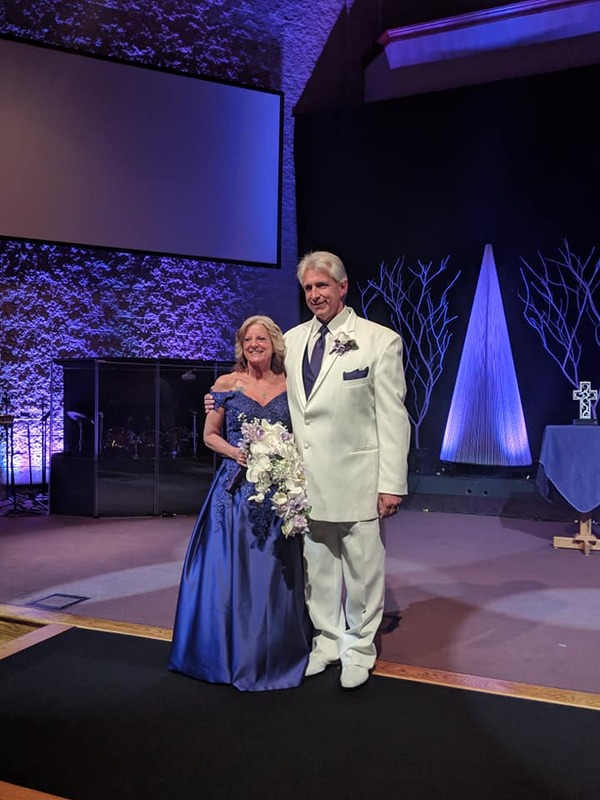 But he remembered some details about the flowers and colors and pretty soon his wife started chiming in with what she remembered about her bouquet. 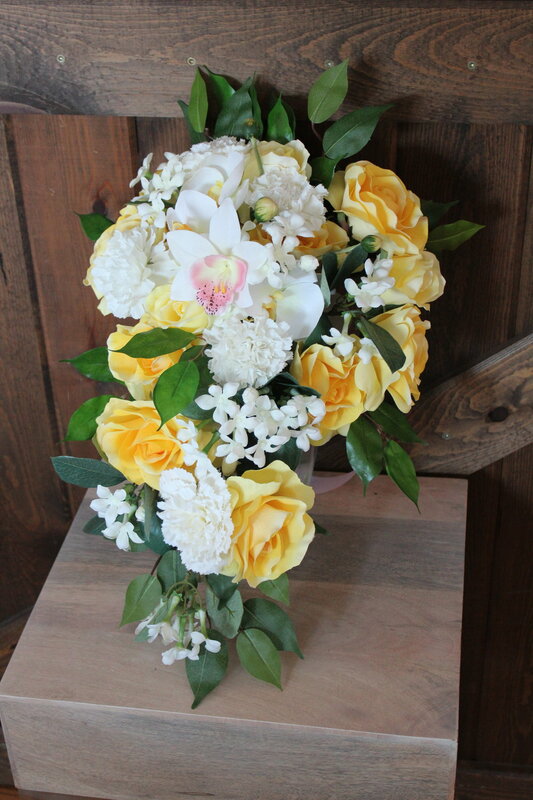 What we knew is that there were yellow Roses, white Carnations, Stephanotis, Orchids (including one with a pink center) and greenery in a cascade style bouquet. 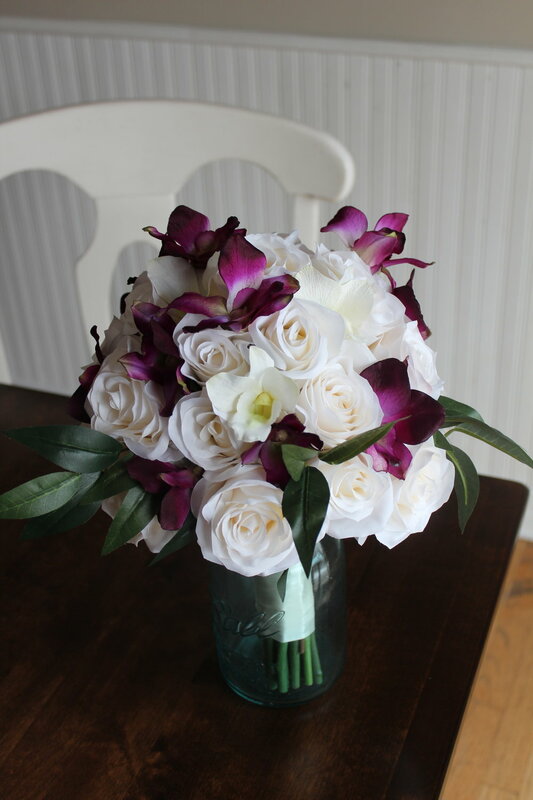 Here’s how Bill’s custom bridal bouquet recreation in silk flowers turned out! The original bouquet. Photographer unknown. This bouquet was a quick turnaround since Bill wanted to gift it to his wife for Christmas. All of our communication was over email and his quick responses made the process smooth and fast. When it was all said and done, Bill said that no local florist would attempt to recreate this bouquet in fresh flowers, which is why his search led him to me. 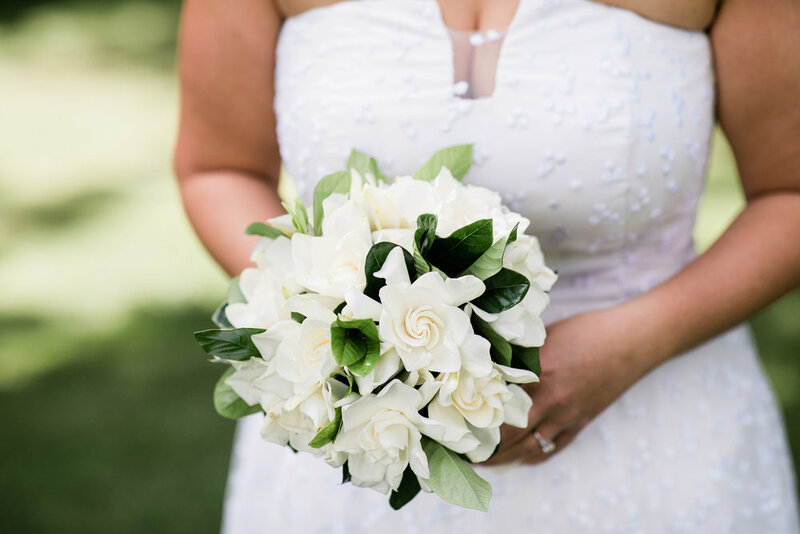 Whether you need a gift with a quick turnaround or you’ve got a few months to spare, contact me today about a custom bridal bouquet recreation in silk flowers. This silk bridal bouquet recreation was such a vibrant breath of color and loveliness in the middle of a dark and rainy fall. 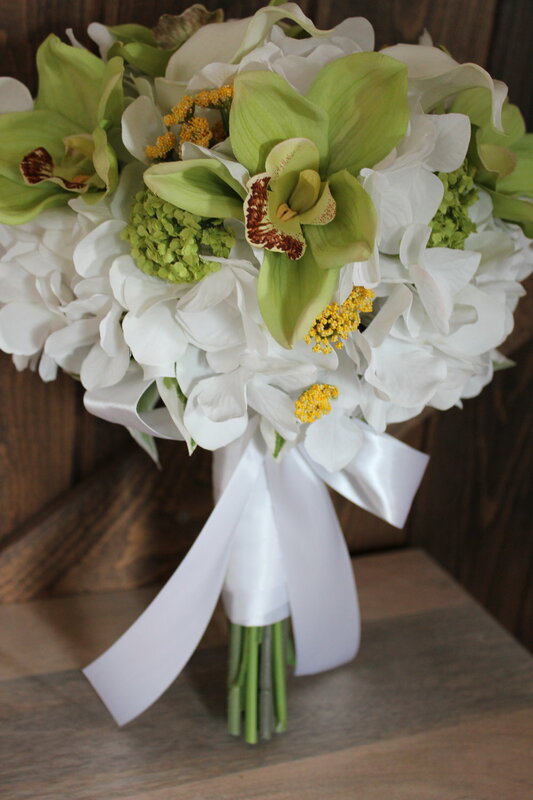 John’s wife had a beautiful bouquet of Hydrangea, Orchids, Calla Lilies and Queen Anne’s Lace, tied off with crisp white ribbon. Take a look! These flowers were the perfect gift for our anniversary! They turned out amazing! They are beautiful and will be around forever to remind us of our special day. Photo provided by the couple. Here’s a side-by-side of the original and the recreation. What do you think? 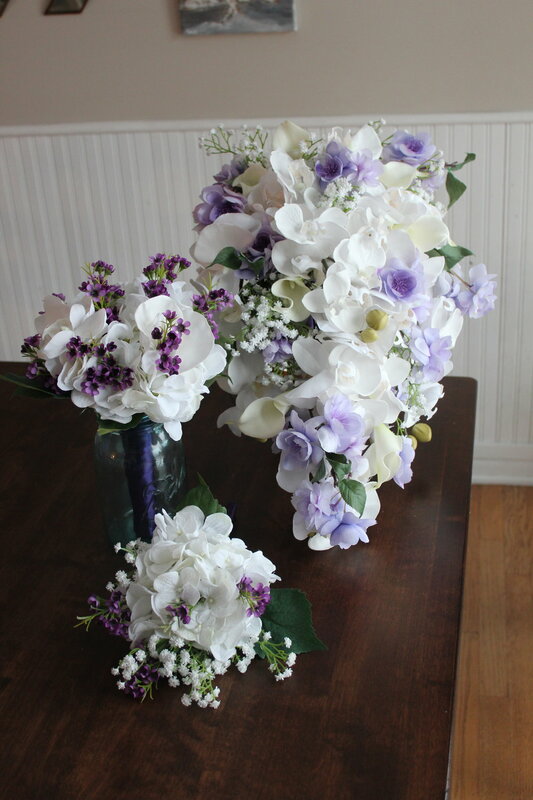 If you are curious about having a bridal bouquet recreated, contact me today to find out the next steps! Sadly, I receive emails like this fairly often, “Our fridge broke when we were on our honeymoon and my wife's wedding bouquet died! She was hoping to have it preserved.” Sometimes it’s a fridge mishap or the preservation process doesn’t end up looking as beautiful as anticipated. If you’re in that boat, I can help! Dustin was the one that sent me that email and I was happy to help him recreate his wife’s beautiful bouquet in time for a Christmas gift. 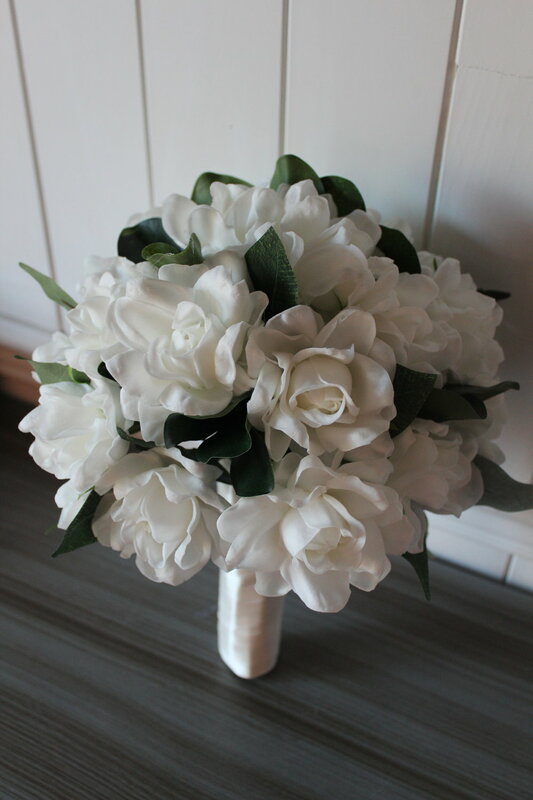 This elegant bouquet was made up of the elegant Gardenia and some greens. Simple and gorgeous! I found some exceptionally realistic fresh touch flowers that were perfect, since they were the focal point! Curious what makes them fresh touch flowers? Click here to read more about fresh touch flowers. 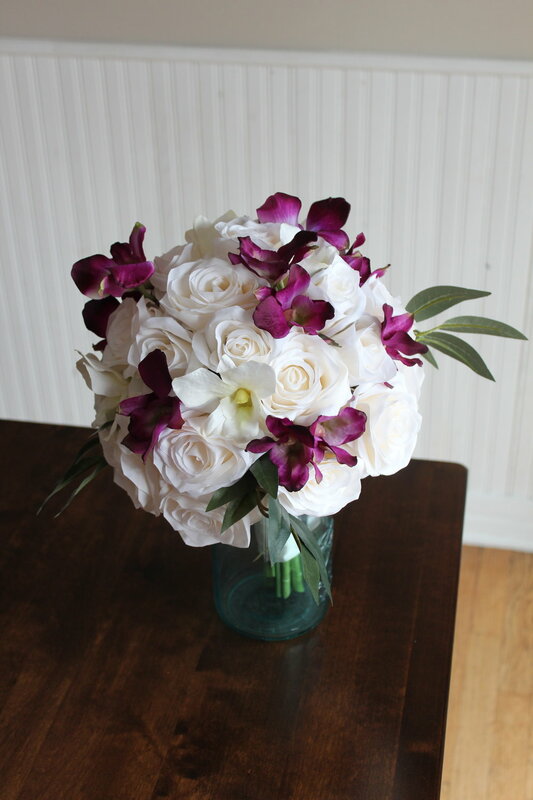 Here’s the original bouquet- so simple and so classy! Image by photographer Tim Ryan Smith. If a preservation fail is part of your story, let’s rewrite the ending together. 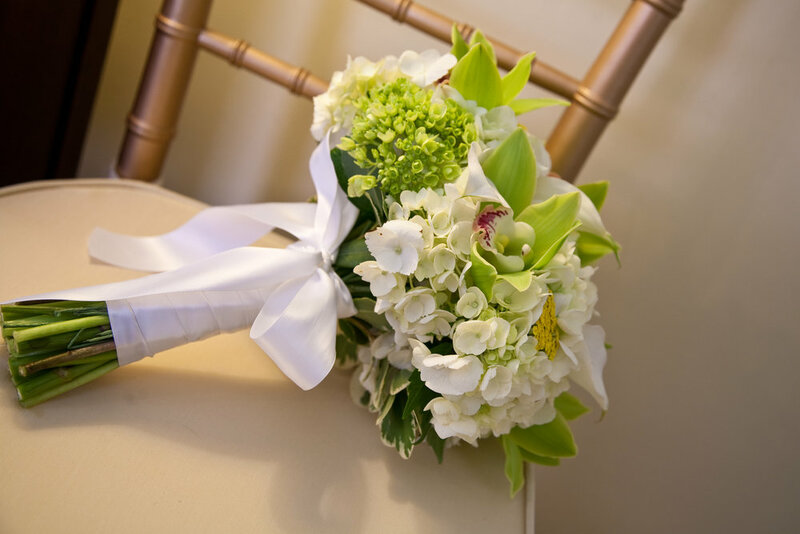 Contact me today to get a quote on a custom bridal bouquet recreation in silk flowers. I love all the silk bridal bouquet recreations that I get to make, but there are a few that are always just so darn amazing. When Anthony sent over some photos of his wife’s bouquet, I knew this was going to be one those hall-of-famers for me. With its Peonies, Ranunculus, Anemone, multiple types of Roses, Thistle, Fern, Lamb’s Ear, and Smilax in such an interesting shape I couldn’t wait to get started on this one. Take a look! Seriously…so amazing! I wish I could have kept it! 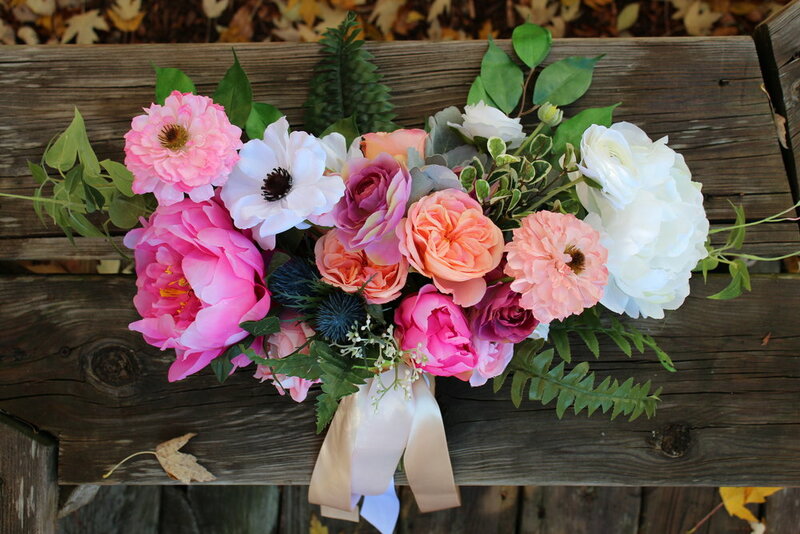 If it’s big, or complicated, or small and simple, your bridal bouquet recreation could be a reality! Contact me today to find out what it would take to have a masterpiece made from just a couple of photographs! While this bouquet was itself pretty straightforward, the details are what made it shine! I’m pretty adamant about getting those details just right to make your anniversary gift that much more special. If you need the perfect gift, look no further. 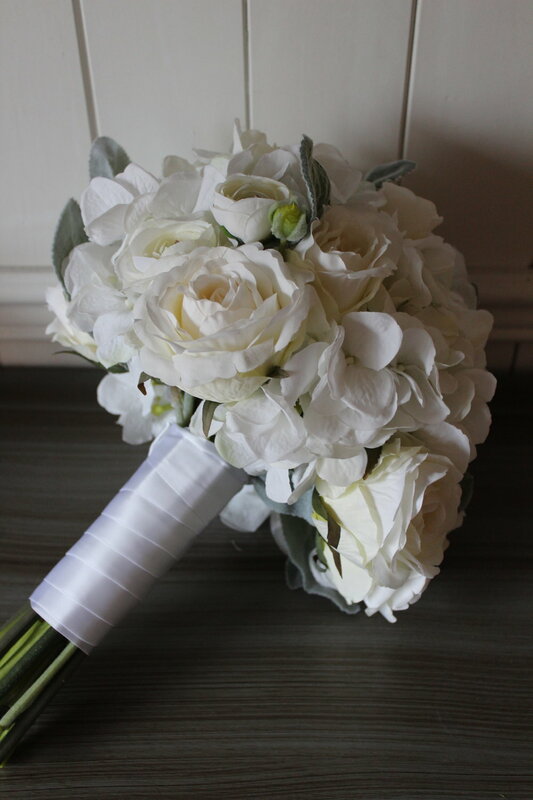 Contact me now for a free quote for your bridal bouquet recreation in silk flowers. 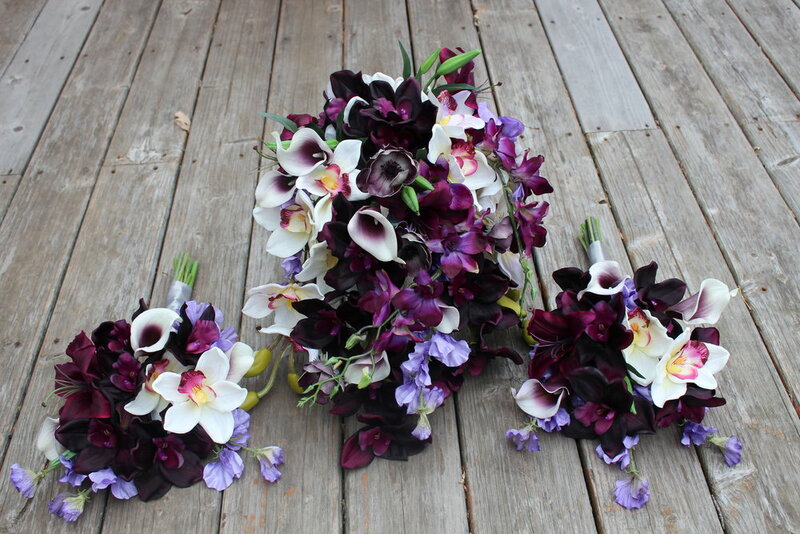 Laura contacted me to make a silk bridal bouquet lickety-split to be there in just two weeks time! She sent me a couple of inspiration photos, but she knew neither one was just right. 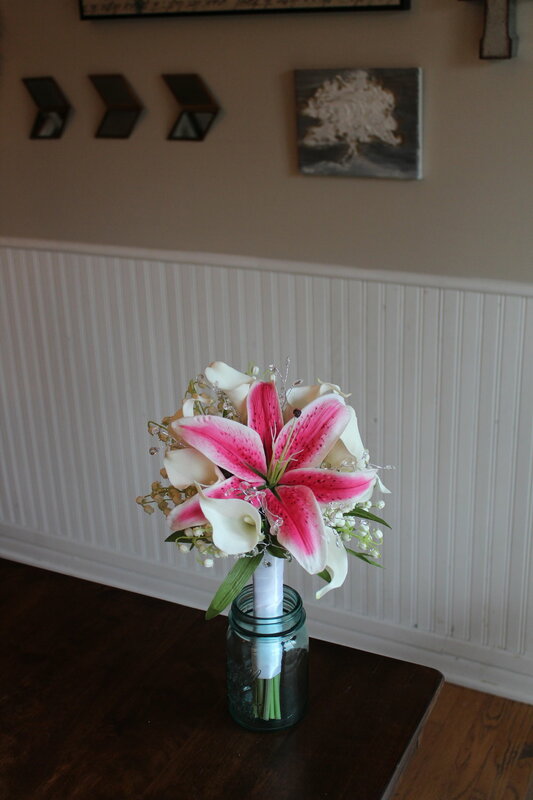 She wanted to include a Stargazer Lily, some Calla Lilies, and at the last minute we threw in some Lily of the Valley to fill out the bouquet a little more. She also requested that there be some bling, so I used some pretty crystal bead sprays to add some glitz without it overpowering this smaller bouquet. Take a look at the pretty little thing! 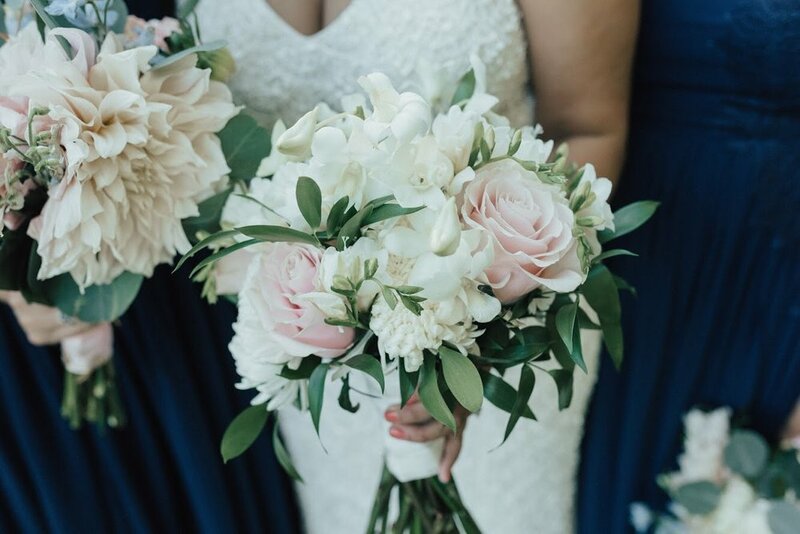 Whether your wedding flower slipped under the radar (or maybe they were never on your radar), contact me today to make sure you have a beautiful custom bridal bouquet in time for your wedding day! Winett contacted me several months ago for her May 2019 wedding. We had lots of time to work on ideas, but she was eager to get it figured it out and check it off the list. So even though I’m writing this in November, her silk wedding flowers have been finished for about a week-Christmas is coming early for Winett! As you may know, or maybe you don’t, purple is one of the hardest colors to work with. It can border on being pink, or red, or blue. So one of my approaches is to use a variety of shades for both an interesting and non-clashy look. Winett knew she wanted to incorporate orchids, specifically Dendrobiums, so I hunted until I found the perfect ones. I then made some suggestions to include other orchids, Calla Lilies, Anemone, Sweet Pea and another type of Lily. Winett loves her flowers and so do I! Bridal bouquet in cascading style and bridesmaids in handtied style. Winett kept her flowers simple and instead of giving boutonnieres and corsages out, she kept to her main girls: the bridesmaids and the flower girls. Below you can see a bouquet and pomander for her flower girls. We kept the same color scheme but switched up some of the flowers. Have a tricky color scheme you are working with? Silk flowers offer a wide variety of colors and types and all year round too! That’s just one of the many benefits of ordering custom silk wedding flowers. Fill out the Free Bride’s Checklist today to get a quote for your unique and custom silk wedding flowers. This year has been record smashing for my little ol’ business here in Minnesota! 250 Recreation, Wedding and Centerpiece Bouquets!! I have all of you to thank for that! You’ve chosen a small business to put your trust in for some of life’s important moments and I’m so grateful for that opportunity. You’ve allowed me to work from home, raise my awesome kids, and be available to work and be with my family year round. Put a giant bow on that, because it truly is a gift to me and my family. Merry Christmas and Happy New Year! Local bride Emilie came to me with a pretty clear vision of her silk wedding flowers. 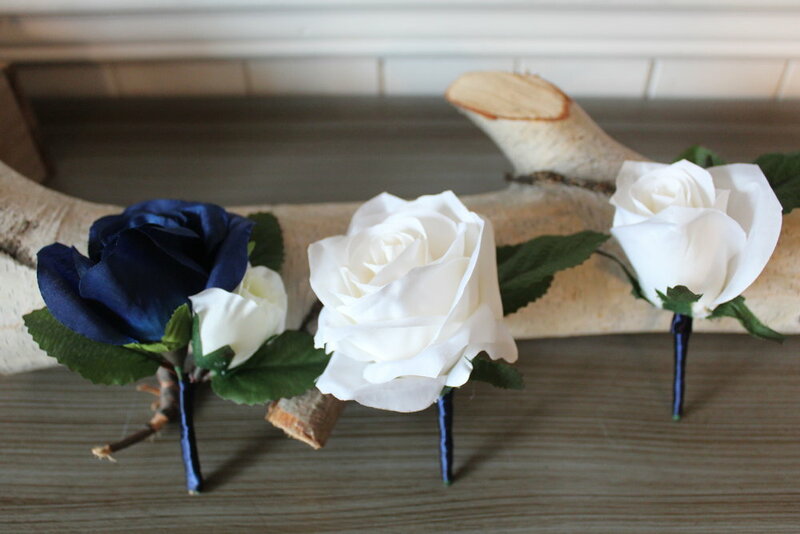 Her color scheme was navy and ivory and she knew she wanted roses. We swapped emails with some of her inspiration pictures and I was able to come with designs that very closely matched those. Take a look at what we designed together! 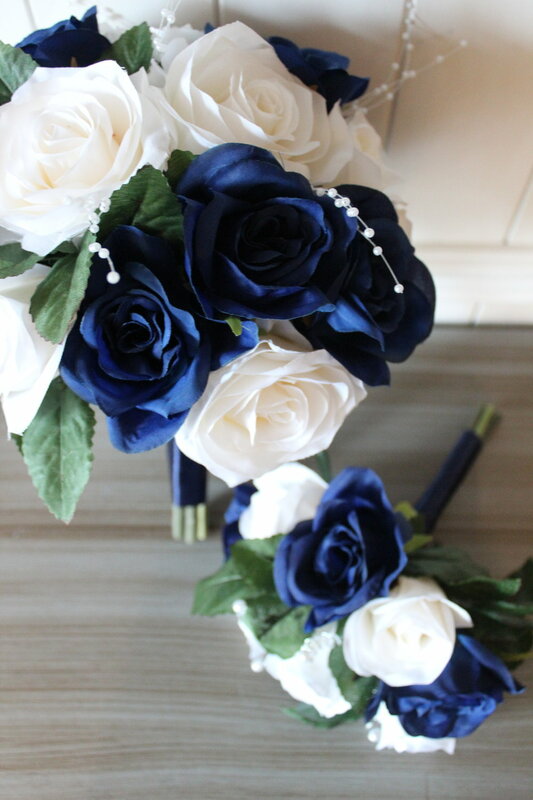 Emilie’s bridal bouquet was a mixture of navy and ivory roses, with some pearls, crystals and greenery mixed in. 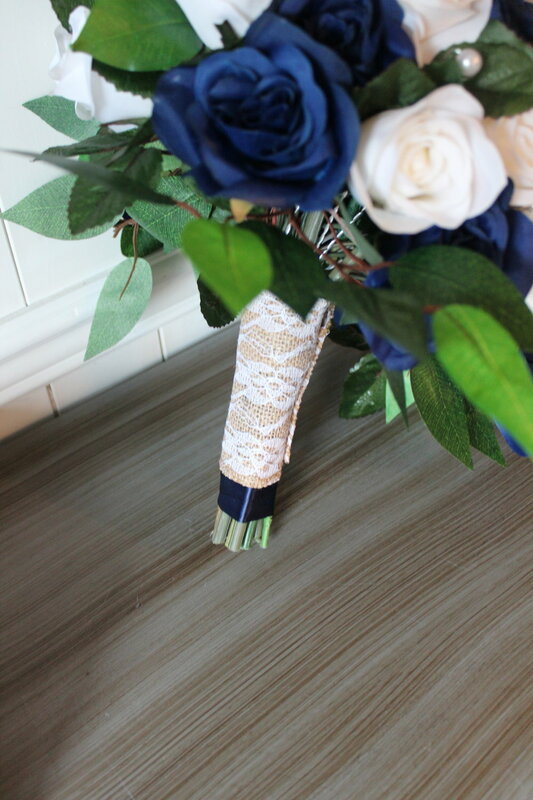 I finished it off with a layer of navy satin ribbon with a burlap and lace overlay to complement some of the rustic elements she was incorporating in other parts of her wedding decor. The bridal party included a maid of honor and best man, but they chose to honor many more of their special guests with custom silk flower boutonnieres and corsages. 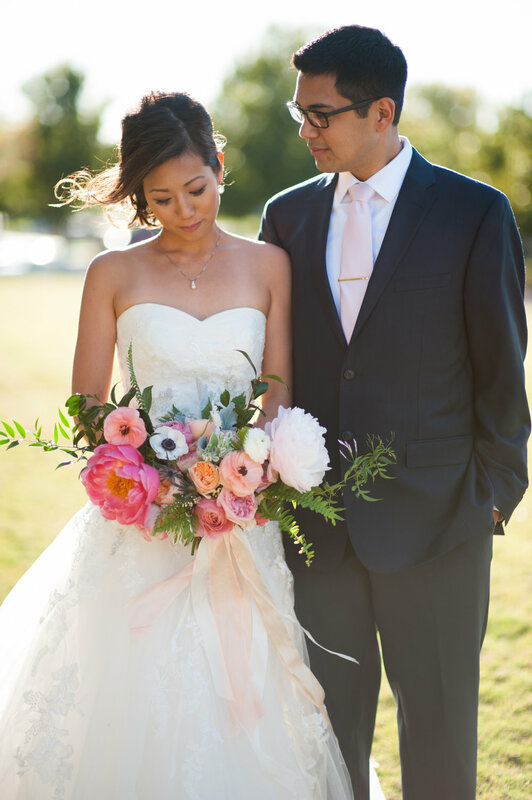 Whether you need 15 bouquet and 3 boutonnieres or 3 bouquets and 41 boutonnieres and corsages like Emilie, silk wedding flowers are the most affordable decision you can make for your wedding. And even with that many arrangements, she was still able to fit custom altar arrangements, flower girl crown, cake toppers, and candle rings into her budget. My next blog post will be all about those “extras” that we all want, but we’re not sure they’ll fit into the budget. If you are interested in seeing how much bang you can get for your buck, fill out the Free Bride’s Checklist today to get your free quote on custom silk wedding flowers. Janelle’s dreamy color scheme was so fun to work with! With a wine/raspberry as her main color and blush and rosegold accents, I felt like I had endless possibilities of what to include in her silk wedding flower bouquets. 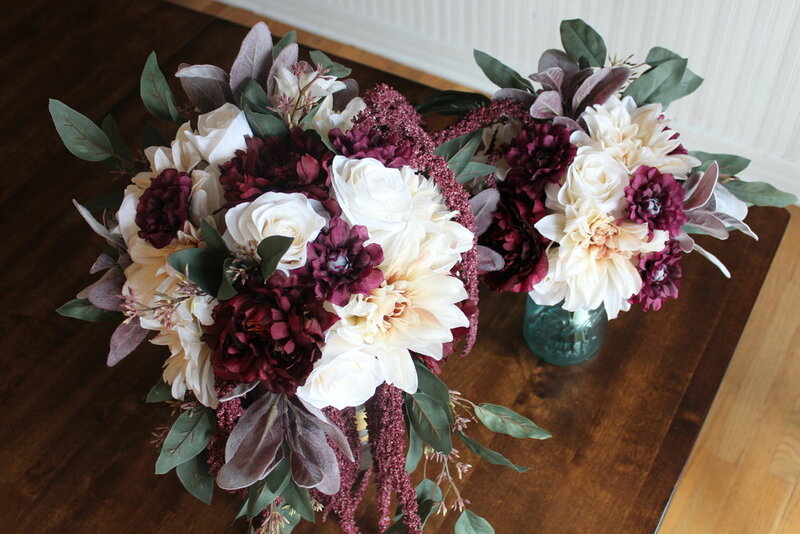 What we settled on was Dahlia, Roses, Mums, and Peonies with some burgundy Lamb’s Ear and Seeded Eucalyptus. 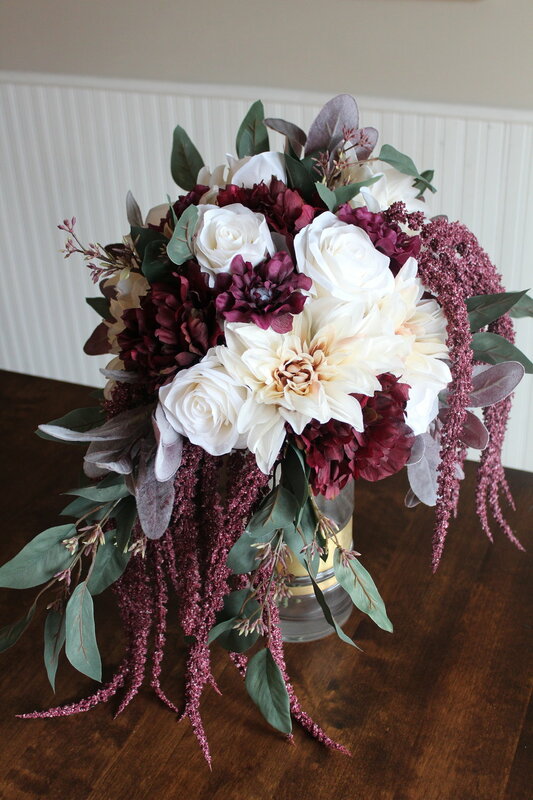 The bridal bouquet also included raspberry Amaranthus for a dramatic edge. 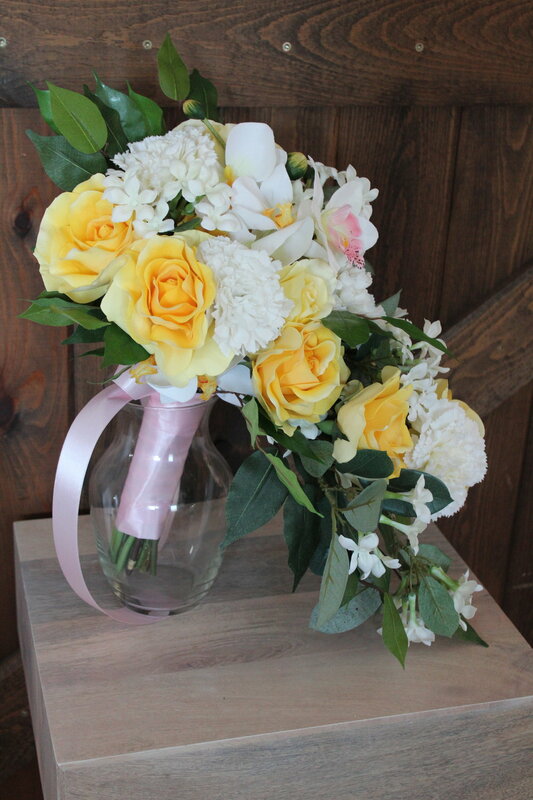 The bridesmaid bouquets were a perfect complement to the bridal bouquet. 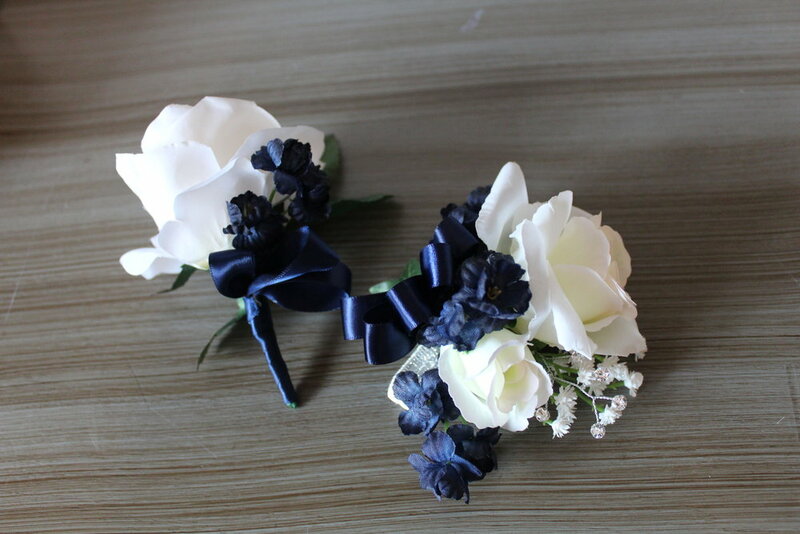 Here’s a quick peak at some of the boutonnieres and corsages to coordinate with the bouquets. 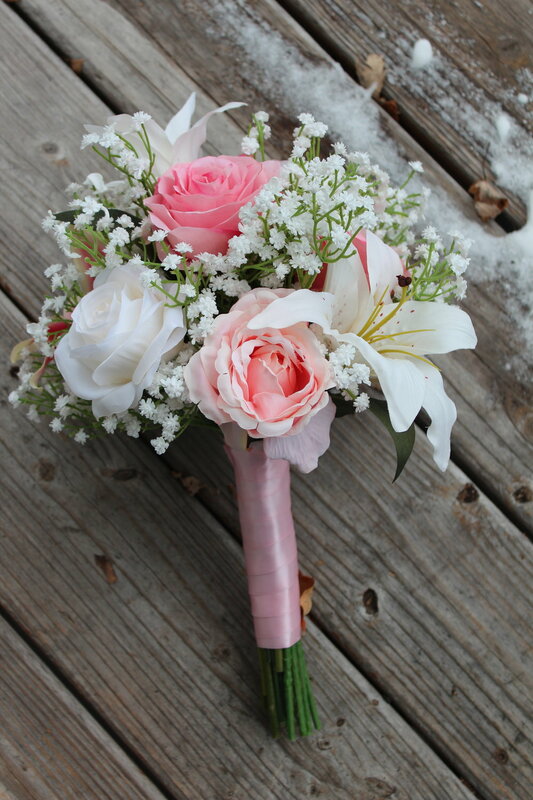 I can’t help it, here’s one more of the bridal and bridesmaid bouquet. I’m kind of in love with this modified cascade, it’s modern and eye catching without being too over the top. 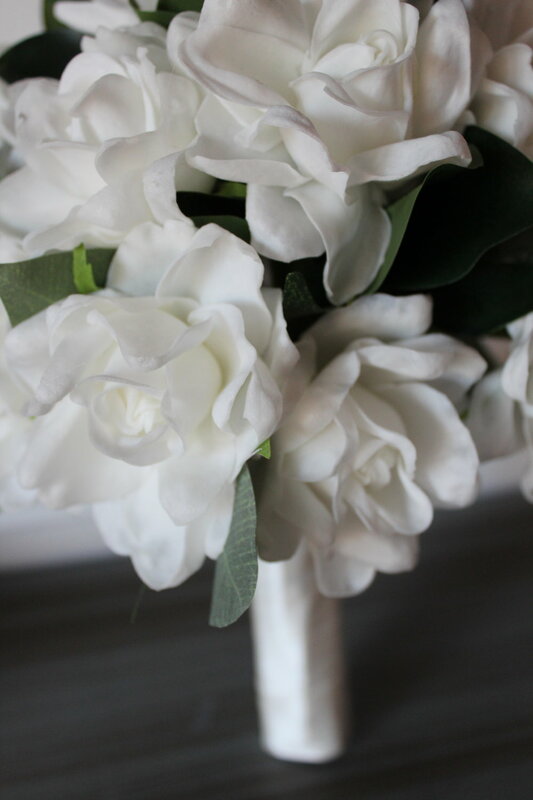 Looking for a modern twist on a classic style, silk flowers offer you the ability to see it before your big day. So no surprises when it’s too late to change anything! We can tweak it until it‘s just right without risking the beauty of the flowers. If that sounds like a dream come true, fill out the Free Bride’s Checklist for a quote and to get started on your custom designs. One thing I’ve noticed is the current rise in popularity of non-green greenery! Confused yet? So think of all the extras that don’t happen to be green but add visual interest and texture to your wedding flowers. One of the most popular items to include is either Lamb’s ear or Dusty Miller, which comes in a variety of shapes and colors. For this bridal bouquet I needed the broad leaf variety to recreate this look just perfectly. 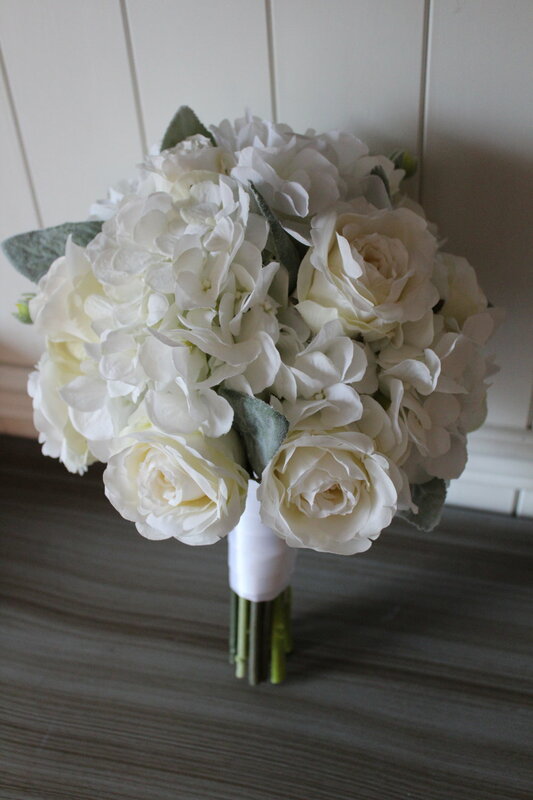 David’s bouquet recreation was a very classic style white bouquet of Roses, Hydrangea, Ranunculus and Dusty Miller. 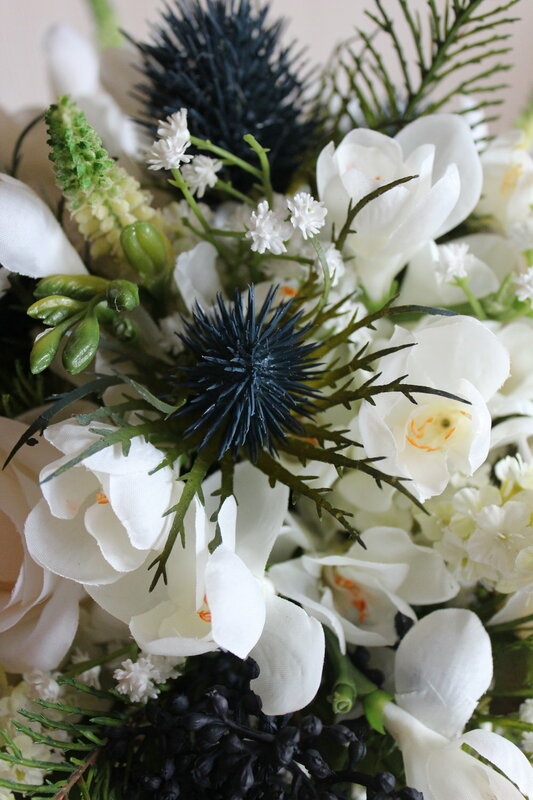 That added bit of “greenery” gave a soft touch to the whole bouquet, and also served to break up the white flowers. It was so elegant! Here’s the side-by-side of the original bouquet photographed by Elyse Hall Photography and the recreation, by me! As always, this is such a great anniversary, Valentine’s Day or “I love you” gift for your bride. Contact me to get started!